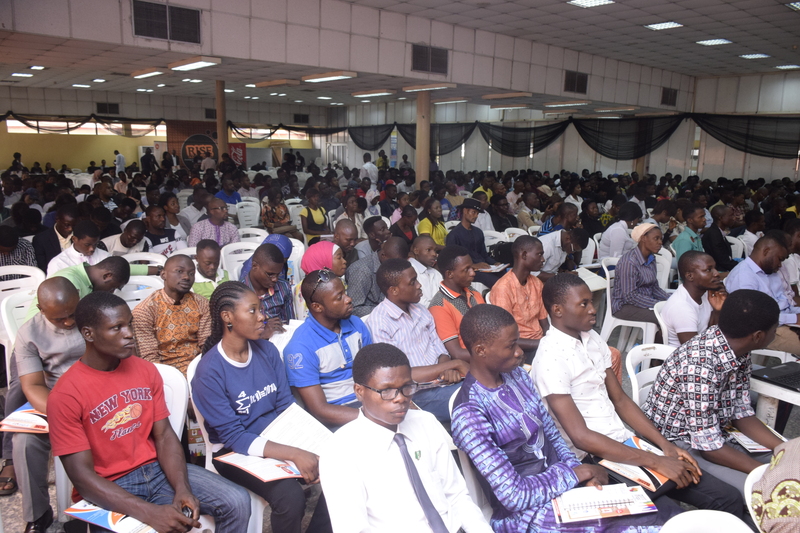 As the University of Lagos was lit last week in commemoration of the 2016 UN International Youth Day on Saturday August 13th, Nigerian youths have been advised to make the best of their situation by embracing entrepreneurship and innovation in order to eradicate poverty. 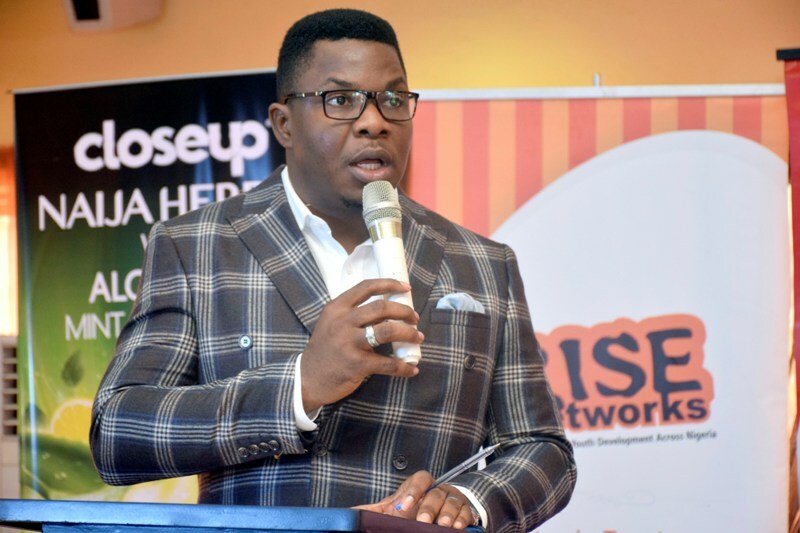 The event had in attendance some of Nigeria’s brightest minds and successful entrepreneurs, including Chief Emeka Anyaoku, Kunle Afolayan, Audu Maikori, Joy Isi Bewaji, Aishah Ahmad, Okechukwu Ofili, Nkemdilim Begho and Dr. Olusegun Mimiko who was represented. 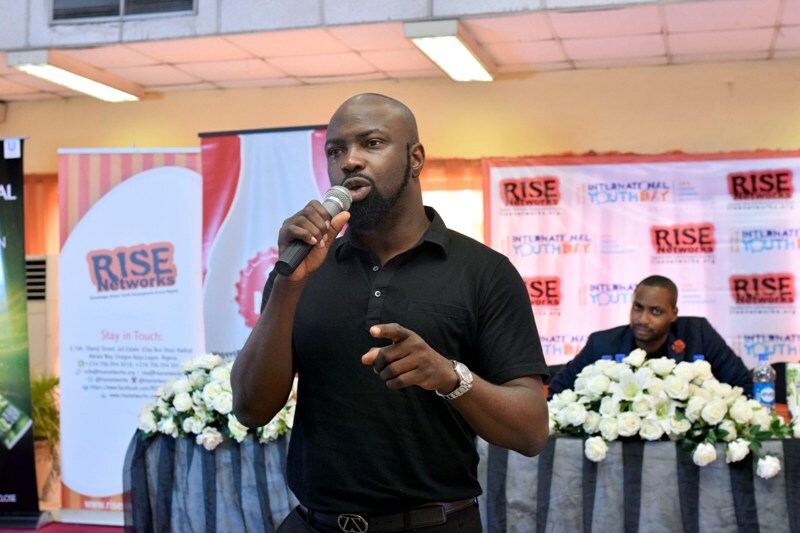 One of the highlights of the occasion was the moment participants discovered that it was Audu Maikori’s Birthday yet he decided to share the day with them. 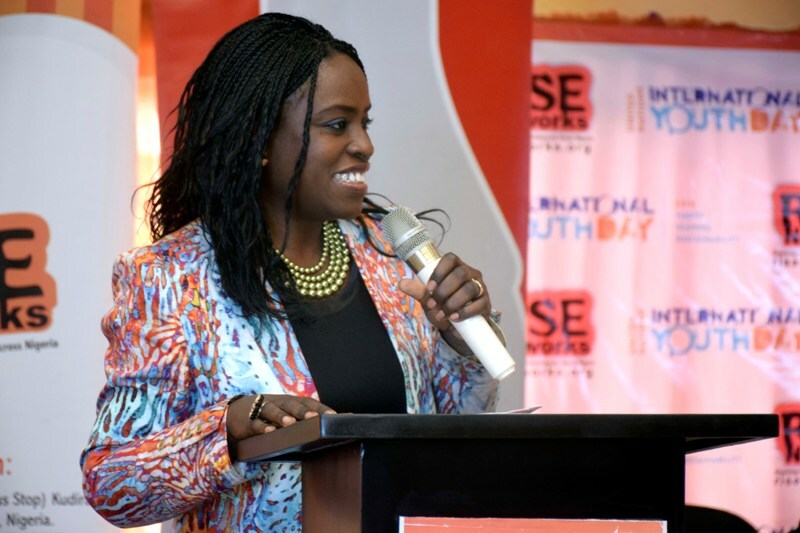 Also, Joy Isi Bewaji’s bold utterances about Nigeria’s leaders whom she accused of “stealing everything and leaving the youths with nothing” was received with wild cheers from the crowd of over 2000 Students who attended the Program. She blamed religion, culture and patriarchy for the prevalent poverty problem in Nigeria while urging youths to reject everything the elders have taught them as it will not take them anywhere. 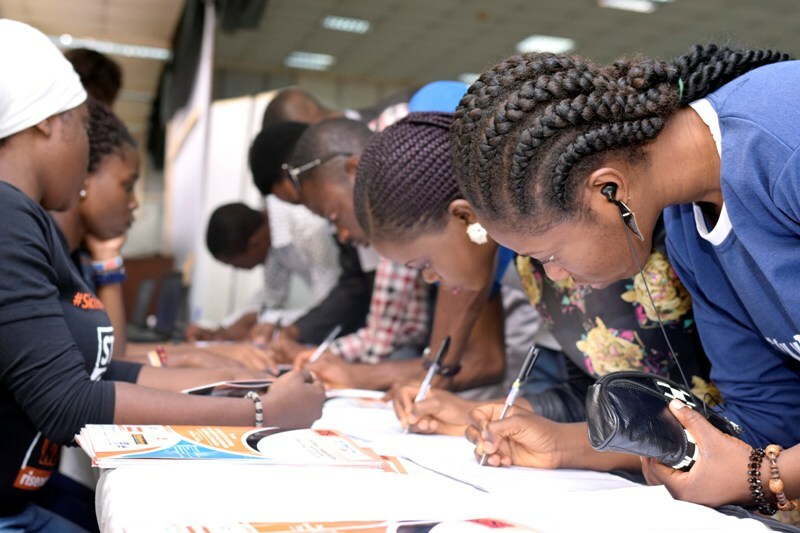 Participants registering by the registration stand at the #IYD2016NG event.  Youths are important agents of social change and for this reason their contributions to sustainable development are necessary.  Youths should embrace entrepreneurship and make use of opportunities available to them especially opportunities available in the agricultural sector. 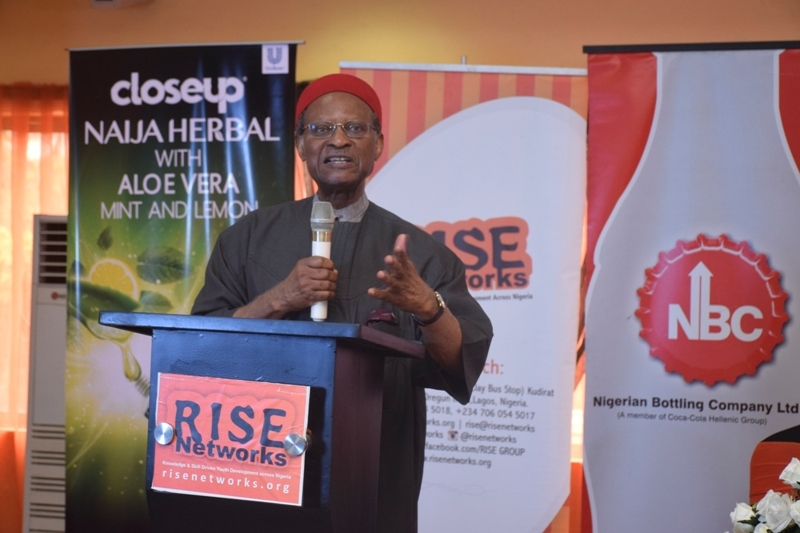 Chief Emeka Anyaoku, Former Secretary General of the Common Wealth of Nations and Chairman of the occasion speaking during the #IYD2016NG event.  Mrs. Aishah Ahmad told the participants that the only way they can benefit from the multiple streams of income available to them is by learning the useful skills, changing their mindsets and ridding themselves of poverty mentality and then looking out for problems within their locality to which they can proffer solution. She stressed the fact that wealth can only be redistributed from the rich to the poor if only the latter can create value to attract the former’s riches. 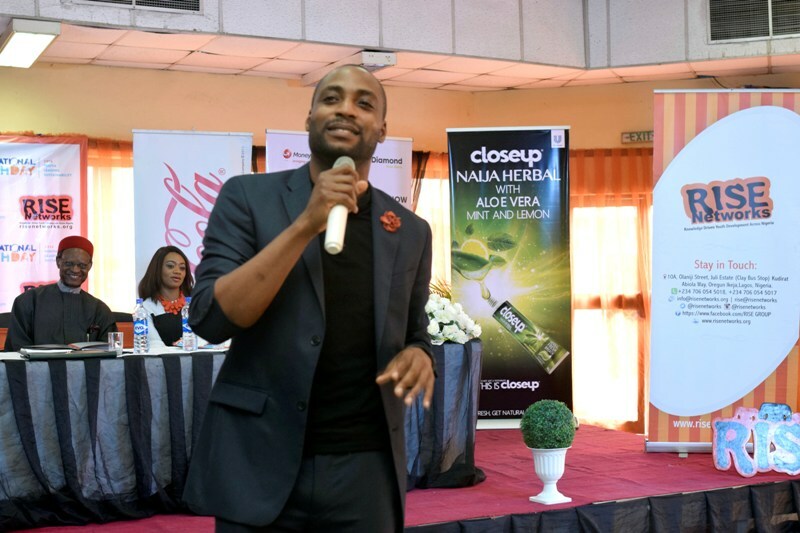  Mr. Okechukwu Ofili of Okada Books also spoke, saying that Nigeria lacks innovation because society makes it seem like problems can only be solved through prayers and narrating the story of how he managed to overcome dyslexia as a child, Mr Ofili said youths can still survive in Nigeria if only they could strive hard to be innovative.  Nkemdilim Begho discussed the immense opportunities that ICT offers. She advised them to make use of these opportunities as ICT is key to the sustainable development drive. One of the speakers Nkemdilim Begho, CEO of FutureSoft speaking on the importance of ICT as a useful weapon Nigerian youths can use to combat poverty at the #IYD2016NG event. 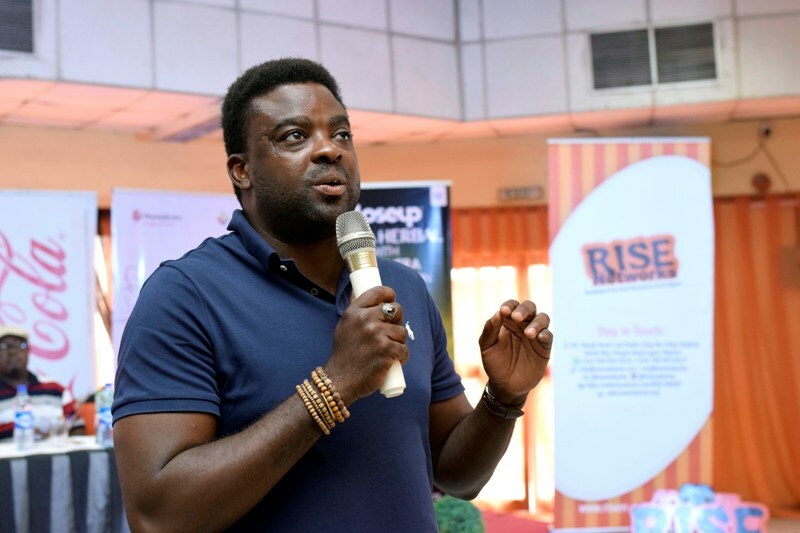 Recounting how he quit his paid employment to pursue his passion for filmmaking, Kunle Afolayan encouraged young and aspiring filmmakers to always endeavor to develop their crafts first before wishing for riches and fame. 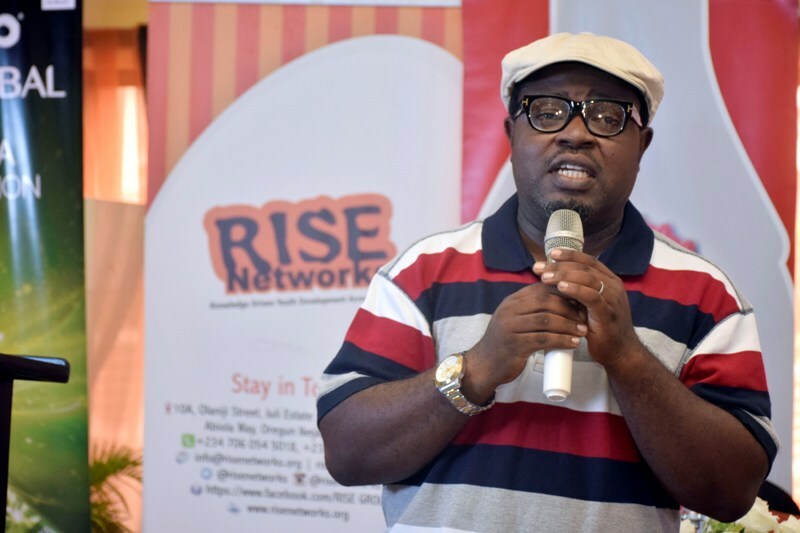 He recognized that there are opportunities in Nollywood for the youths, however only the talented and skilled ones can be successful in the industry. Prominent Nigerian filmmaker, Kunle Afolayan discussing the opportunities present in Nollywood for Nigerian youths at the #IYD2016NG. 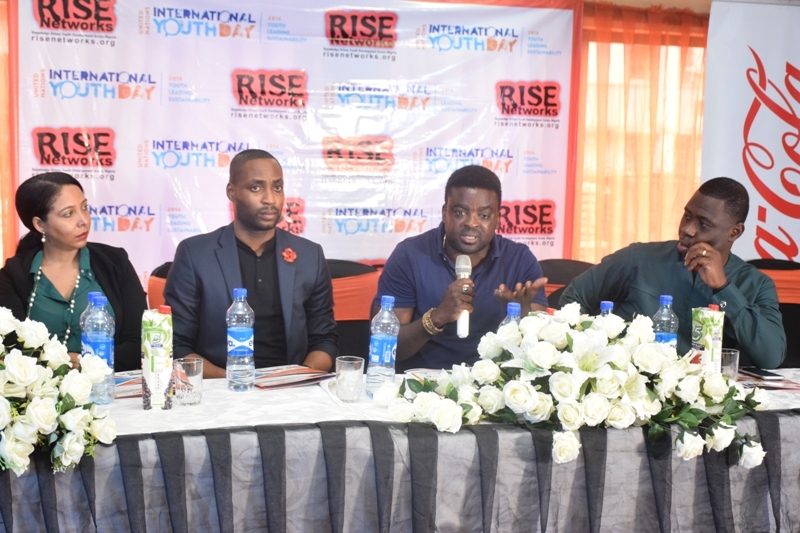 The Nigerian commemoration of the 2016 International Youth Day event also witnessed an interactive session during which the young people got the opportunity to ask questions and air their views. 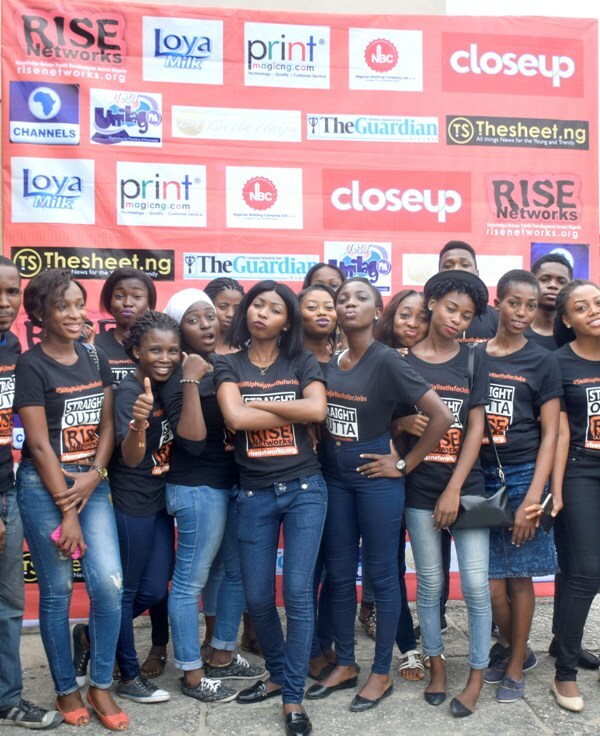 Some representatives of our sponsors and partners such as Nigeria Bottling Company, Loya Milk, Printmagicng.com, Close Up and Diamond Bank gave out tones of freebies to the excited participants who were seen leaving the venue chatting in groups about the impact of the event on them and how much they intend to move form motivation to action. 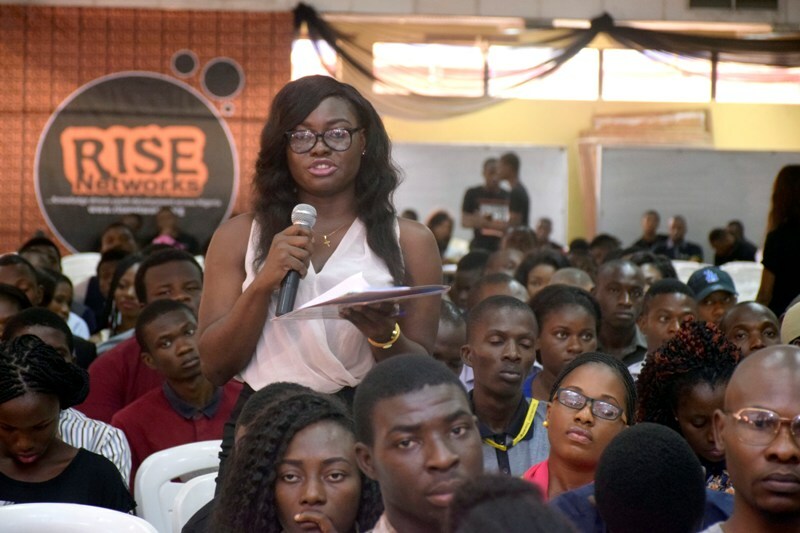 There was plenty of room for audience members to ask questions as well as contribute to the discussion at the #IYD2016NG event. 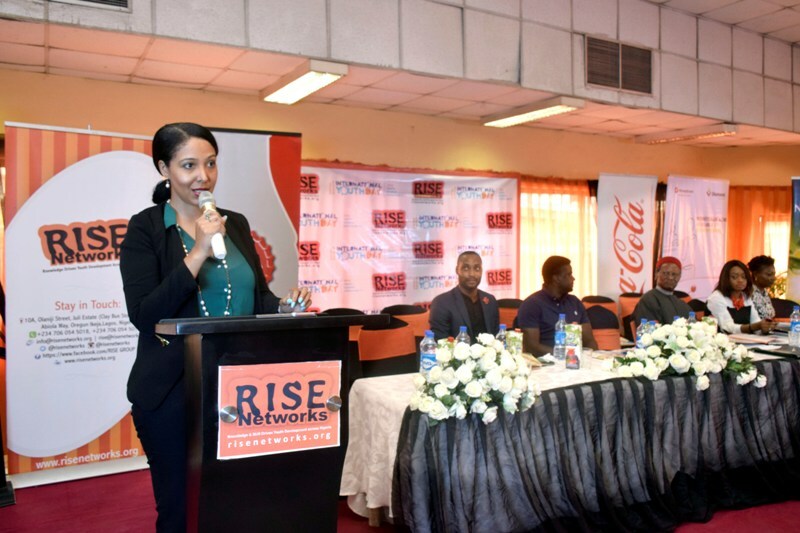 This Program was hosted by Rise Networks, Nigeria’s Leading Social Enterprise on Youth in Education, Entrepreneurship and Public Service in partnership with the UN Office in Nigeria to mark the 2016 Celebration of the United Nations International Youth Day. 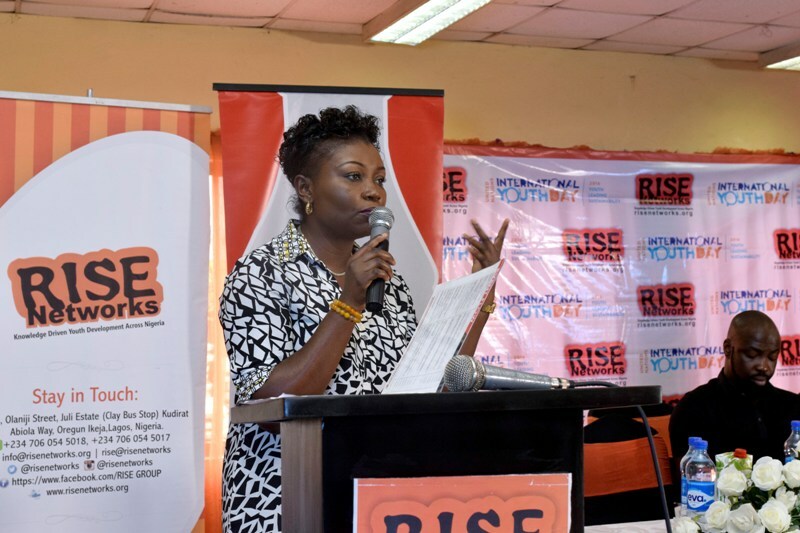 The Head of Consumer Banking and Investment at Diamond Bank PLC and Chairperson of WIMBIZ, Ms. Aishah Ahmad at the #IYD2016NG event as she called on youths to develop the right attitudes and useful skills that will enable them tap into the multiple streams of income available to them. Ms. Joy Isi Bewaji, Feminist Writer, delivering her speech at the #IYD2016NG event as she expressed her concerns that the older generation is stealing everything and leaving the youths with nothing. Mr. Audu Maikori, Lawyer and Music Mogul speaking on the need for Public-Private partnership in the entertainment sector at the #IYD2016NG event. Guest Speaker Okechukwu Ofili of Okada Books delivering his speech at the #IYD2016NG event. 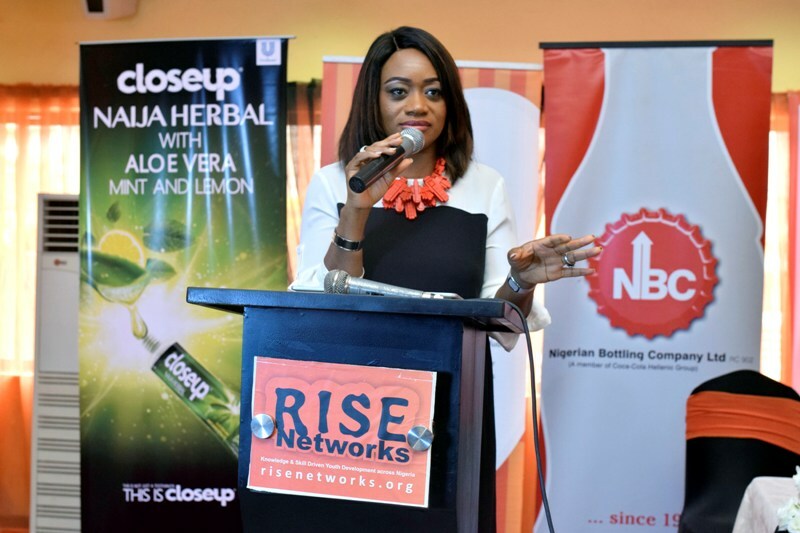 Ms. Sade Morgan, the Legal, Public Affairs and Communications Director of the Nigerian Bottling Company delivering a brand talk during the #IYD2016NG event. Mr. Lanre Olu-Adeyemi, Senior Special Assistant to the Ondo State Governor on Special Duties, Research and Strategy representing the Governor at the #IYD2016NG event. Mr. Kunle Afolayan, responding to questions while Nkemdilim Begho, Okechukwu Ofili and Mr. Kunle Soriyan looks on at the #IYD2016NG event. 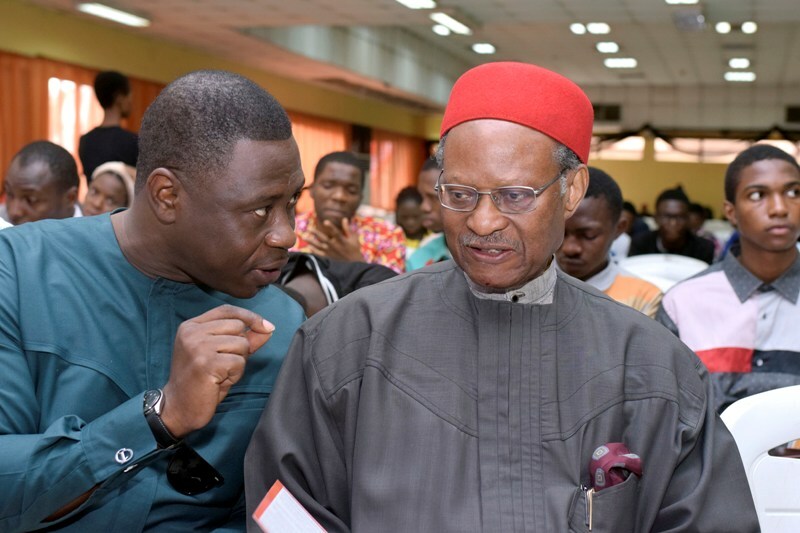 L-R: Mr. Kunle Soriyan engrossed in discussion with Chief Emeka Anyaoku as the latter listens intently at the #IYD2016NG event. Some of our volunteers at the #IYD2016NG event.